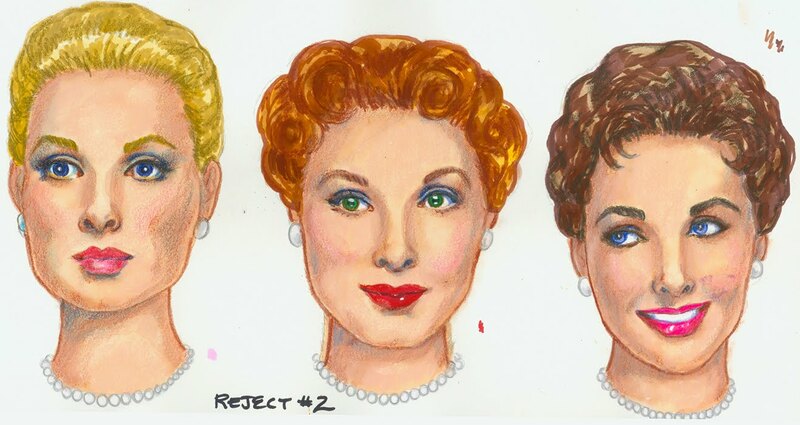 I’ve begun my next paper doll book for Paper Studio Press, “Hollywood Gets Married.” Three bride dolls will wear some of the most beautiful wedding gowns ever created, confectionary creations worn in movies such as Father of the Bride, The Philadelphia Story, It Happened One Night and many others. Also included will be outfits worn by star brides for their real-life nuptials. Creating the dolls who will wear the gowns of many stars was a challenge for me. I sought faces with star quality, but not exact likenesses of specific stars. I wanted three different types, a blonde, a redhead and a brunette. I was inspired by Grace Kelly, Arlene Dahl and Elizabeth Taylor. To achieve the fusion of actual stars and doll-like models, I did three versions until I was satisfied. The groom gave me no problem. He’s a dead-ringer for Tyrone Power! Researching Hollywood wedding gowns is my idea of a fun time. So many vintage movies end with the leading lady looking lovely as a bride, ready to live happily ever after. Of course, she’s always attired in a fairy tale gown. 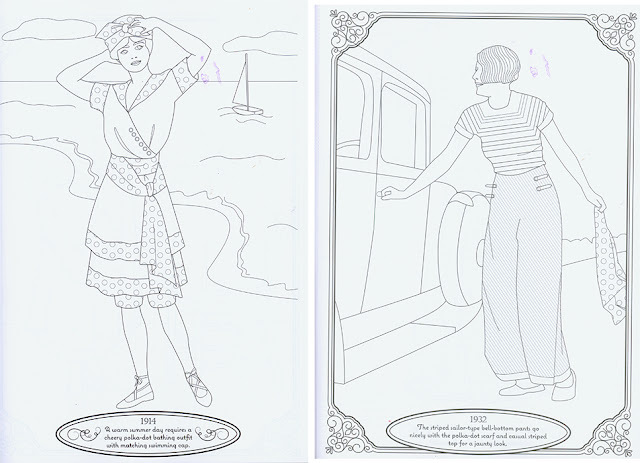 I found it interesting that the look du jour was reflected as times changed and the silhouette shifted from the slinky ‘30s to the broad shouldered ‘40s and the full-skirted ‘50s. Not all brides wore white, though. For their real-life weddings, Jeanette MacDonald picked pink, Rita Hayworth chose blue and Deanna Durbin’s eight bridesmaids formed a living rainbow. My personal all-time favorite wedding dress is Audrey Hepburn’s Givenchy in Funny Face when she and Fred Astaire danced together in a romantic French country churchyard setting. Audrey Hepburn, Grace Kelly, Elizabeth Taylor. Claudette Colbert, Julie Andrews, Marilyn Monroe. Who's Who in High Fashion? You probably have not kept up with all the firings and hirings that have taken place in the fashion world lately. Here’s who’s designing what for spring ’17 and it’s likely you’ve never heard of them. Anthony Vaccarello is the new Yves Saint Laurent (deceased), succeeding Hedi Slimane. Balenciaga is now the hot Paris label because it is being created by Dema Gvasalia who caused a sensation with his own line, Vetements (which he continues to design.) Valentino (still living) has recently been designed by Pierpaolo Piccioli and Maria Grazia Chiuri but they split and Maria is now designing Christian Dior (long gone, of course) which most recently was created by Raf Simons who is now replacing Francisco Costa at Calvin Klein. Confused? Me, too! Yves Saint Laurent, Valentino, Balenciaga, Christian Dior. The Countess Greffulhe’s extravagant wardrobe is now on display at the FIT (Fashion Institute of Technology) Museum in Manhattan. The exhibition is an exercise in elegance, tastefully displayed and dramatically lighted, conjuring up an atmosphere of a lost time. That’s as it should be since the auburn-haired Countess was a muse to Marcel Proust whose novel, A la Recherché du Temps Perdu (In Search of Lost Time) is considered a masterpiece. The author created several characters inspired by the Countess and frequently attributed her haute couture wardrobe to characters. There are many extraordinary pieces on display, demonstrating the Countess’s professed desire to “look bizarre rather than banal.” One such effect was achieved in 1904 at the wedding of her daughter when the Countess’s gown of bejeweled gold embroidery with a fur bordered circular train completely upstaged the bride. This very worthwhile exhibition is on display until January 7, 2017. Vintage photographs of the elegant Countess. A quartet of extravagant gowns on display. Spring ’17 fashion promises to be a rainbow of vivid hues, often in startling combinations. 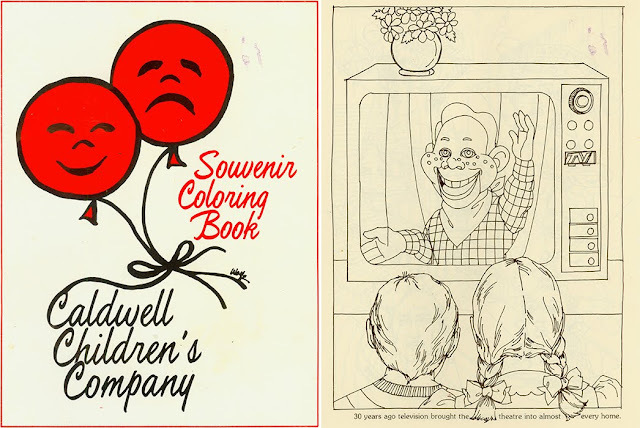 Whereas in years long past, every new season saw the promotion of a singular fashion color. Remember “Think Pink” for example? The past couple of decades have been dominated by black and more black. Now bold color is making a refreshing comeback in many cutting edge collections. 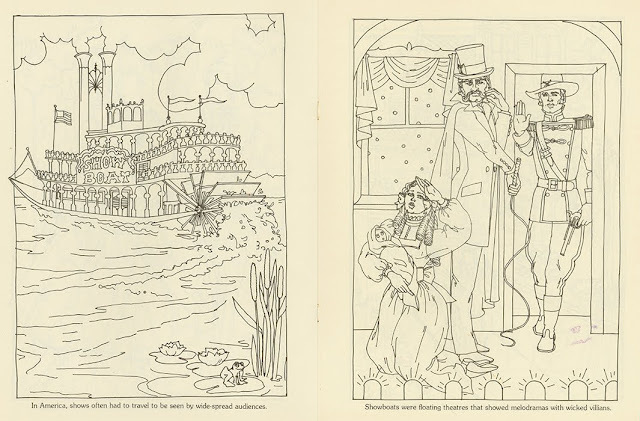 Coloring books are everywhere, these days. What began as a sort of stress-relieving past time is rippling out to include more diversified subjects. 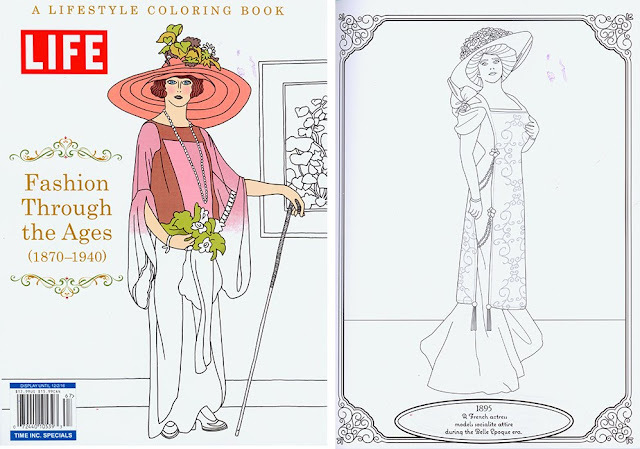 Fashion is an obvious area and Time Life has published a multi-page book, “Fashion Through the Ages 1870-1940.” It is illustrated by Sarah Brody whose simplistic line drawings are perfect for colorization. I found the book in an unlikely place…the check-out line at my local supermarket! Seeing so many coloring books on offer reminded me of a coloring book project I did decades ago, a fund-raiser for a children’s theatre in Boca Raton, Florida where my young daughter and son appeared in some charming productions in the mid-1970s. 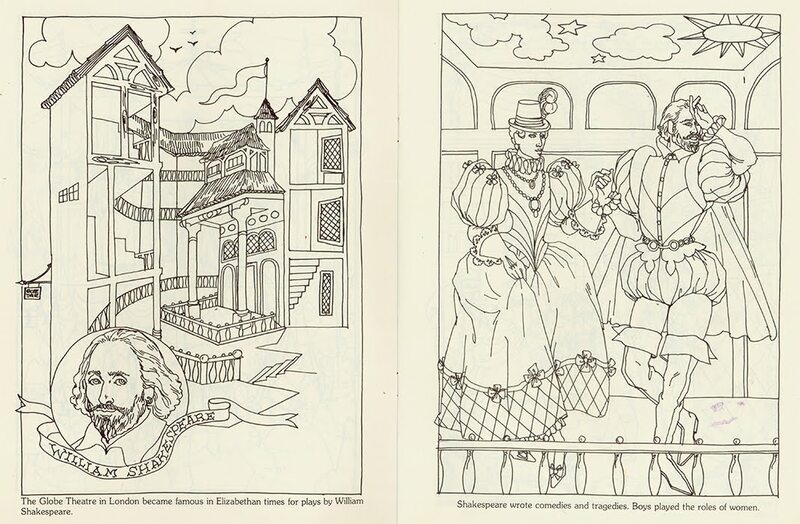 I’m thrilled to see the renaissance of coloring books but I pine for the good old days of glamorous movie star coloring books. Children’s Theatre Fund-raiser by me, circa 1975. 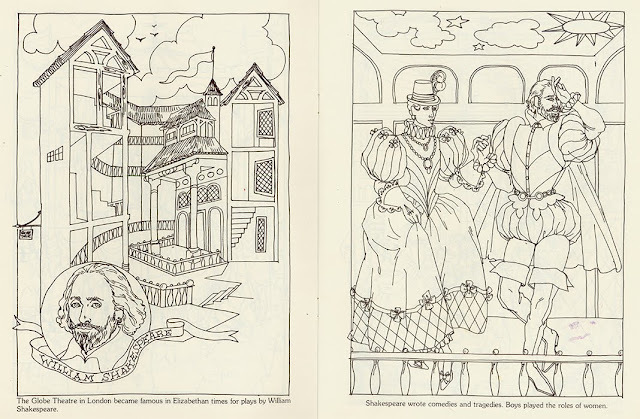 Shakespearean theatre and players to color. Showboat theatre and melodrama scene to color. 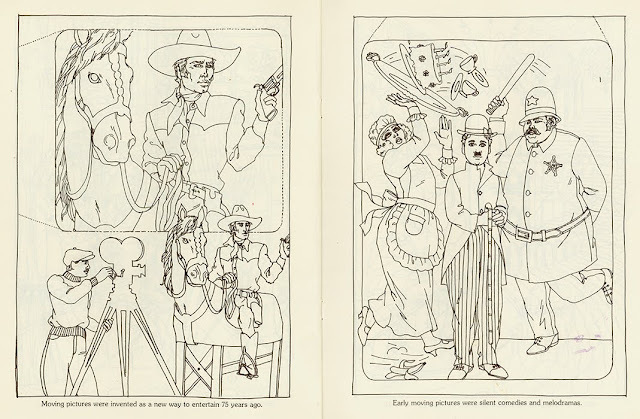 Vintage Western movie and slapstick comedy to color. Fashion Through the Ages contemporary coloring book. 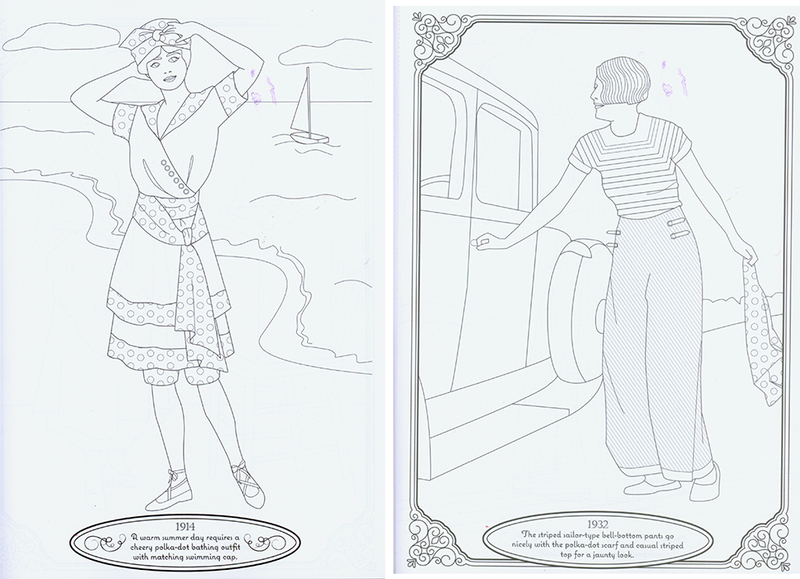 Sample pages of vintage fashion to color. They just keep turning up on the runways in the collections of high-price designer duds. Even though this most humble of garments is often the worst for wear and tear, it is usually paired with a fancy top of some kind rather than the t-shirt that usually tops jeans worn by the mainstream public. Powerful editor Anna Wintour deserves credit for this schizoid coordination because her first Vogue cover published in August 2012 featured jeans worn with an extravagantly bejewelled Christian LaCroix top. It created quite a stir then, but wouldn’t rate a second glance today. Paul & Joe, Dsquared2, Saint Laurent. The Joy of Paper Doll Collecting! 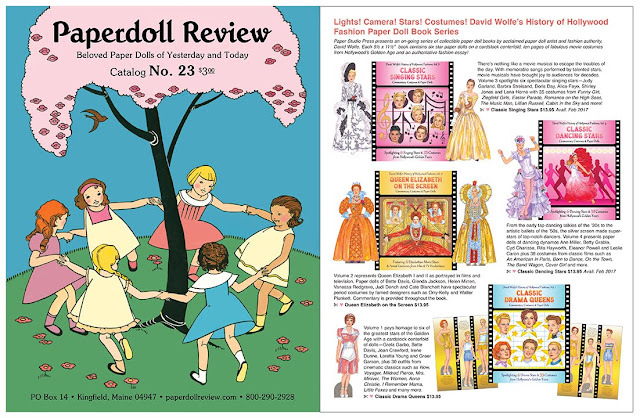 The new catalog from Paperdoll Review is now available and it is like a dream-come-true for those of us who love to collect. Catalog No. 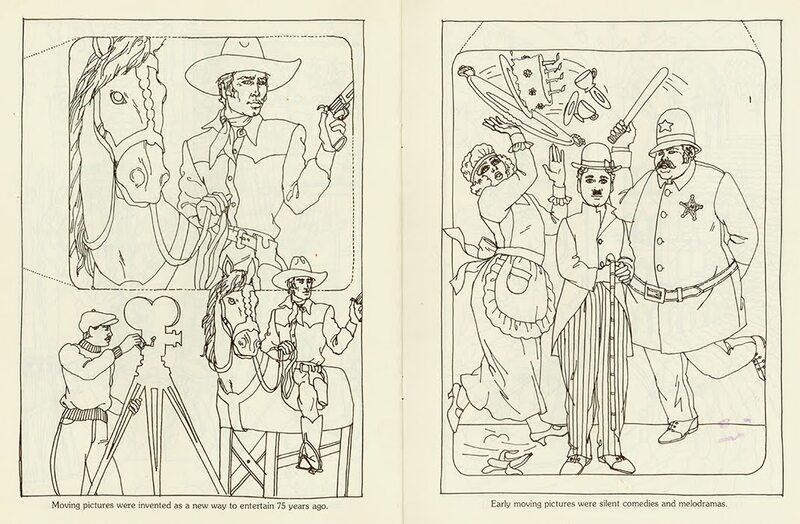 23 has 56 pages of paper doll books, sticker books and coloring books. It is filled with treasures, and browsing the colorful pages provides hours of fun, deciding what the "must-haves" are to add to your collection. The catalog itself is a collectible. It includes an adorable Hilda Miloche "Vacation Time" paper doll as well as a $3.00 coupon for your next order. The only down-side is the difficulty of deciding what to order. So much to choose from! Start with catalog if you don't already have one. To receive the Paperdoll Review Catalog No. 23, send $3 to Paperdoll Review, PO Box 14, Kingfield, ME 04947, or order online. I'm thrilled to see so many of my paper doll books in the catalog including the new Volumes 3 and 4 of my on-going series, “David Wolfe’s History of Hollywood." Pre-orders are now available for Classic Singing Stars and Classic Dancing Stars, to be shipped in February 2017. Volumes 1 and 2, Queen Elizabeth on the Screen and Classic Drama Queens are currently available.